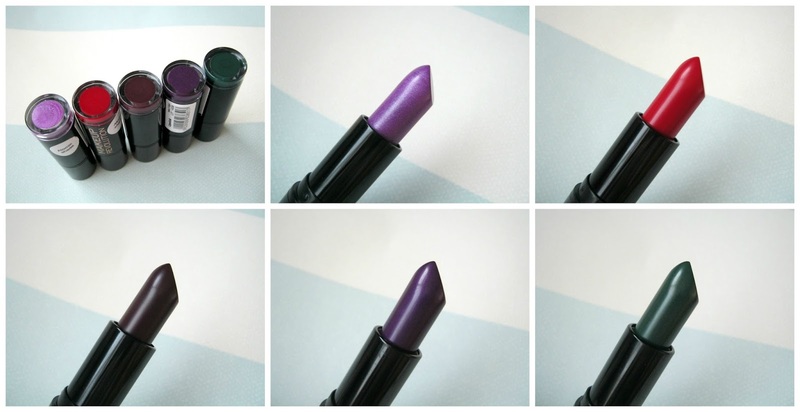 I really wanted to get this post up before Halloween but life has been so busy recently that I just never got around to it but these lipsticks are still definitely worth writing about. When they first arrived in the post I did instantly think they'd be perfect for Halloween but that doesn't mean they aren't wearable, some shades are definitely easier to wear on a day to day basis than others though. If you like intense colour then this new collection of lipsticks is definitely for you, it would be perfect for makeup artists just starting out as well! The Atomic Lipstick Collection is compiled of 5 intense lipsticks that offer a lot more colour than your average everyday pink does. 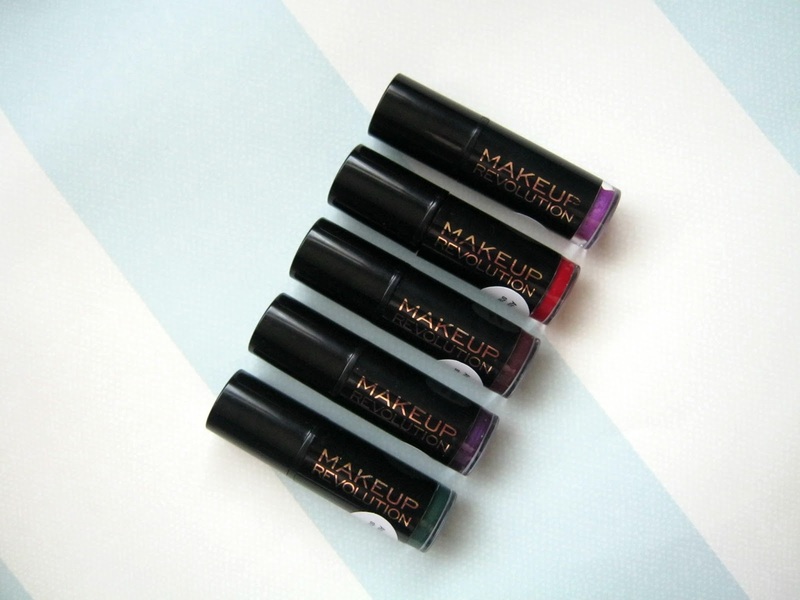 The packaging is the same as the other Makeup Revolution lipsticks, simple and practical. I really like that you can see the colour at one end of the lipstick, it makes finding the shade you want so much easier when you are delving into a sea of lipsticks in the morning. I can't say all the shades are to my liking but I think Makeup Revolution have covered most of the bases when it comes to bold colours, I think most people will be able to enjoy at least one or two shades out of the 5. 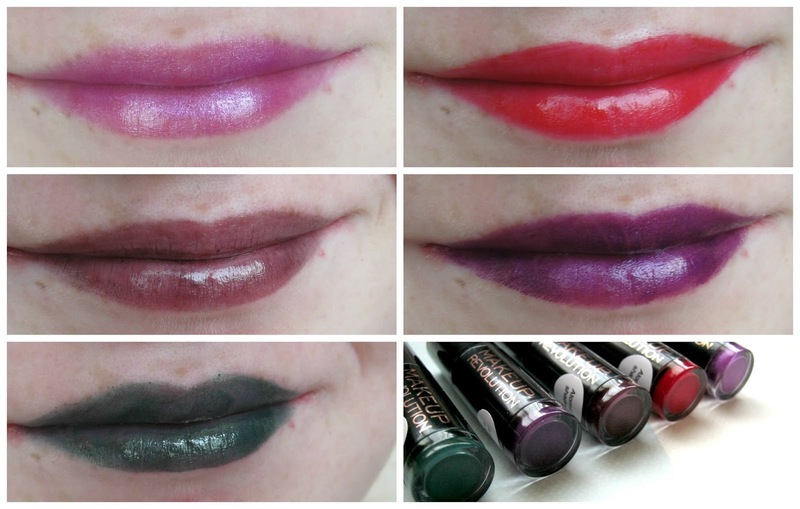 The main thing that makes these lipsticks stand out is the colour range available, I've personally never owned a green lipstick! 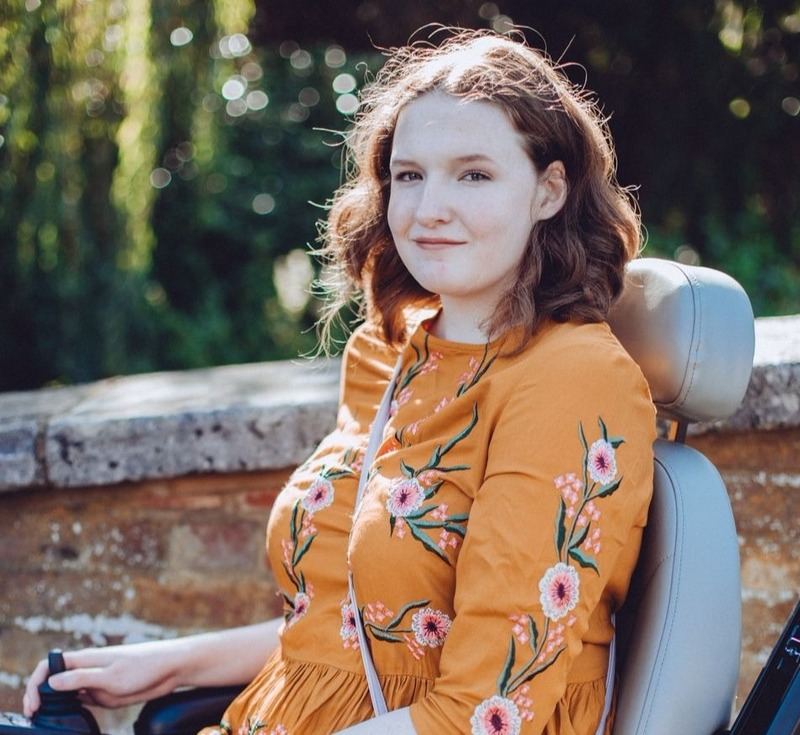 There are some fun shades there and also some really wearable shades, I've been enjoying wearing a light coat of Make Me Magnificent with minimal makeup, it suits my pale skin really well. If I was brave enough to wear a red lipstick I think I'd be picking up Atomic Ruby all the time, it's a stunning bold red with a creamy finish. The only shade that I really didn't get on with is Make Me Tonight which is a sheer dark brown, it just isn't to my liking. The rest are all such fun colours and would be great for those who want to experiment a little without spending lots! 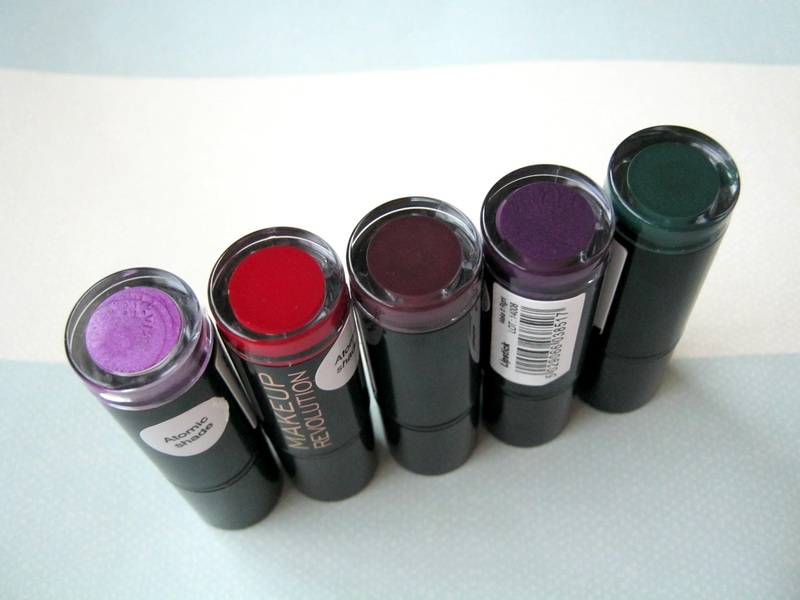 They are all really intensely pigmented, minus the brown shade, and I found that they applied with ease. The creamy formula enables them to just glide on to your lips and the despite the fact that I'm useless at applying lipstick I found them pretty easy to work with! In general they all lasted for about 4 hours on me, they are very creamy so don't stay put for as long as other bold lipsticks might. For only £1 though I don't think you can go wrong! Make Me Magnificent is staying in my makeup bag and I can't wait to experiment with the other shades a little more, I'm especially looking forward to creating some fun looks with Atomic Serpent! 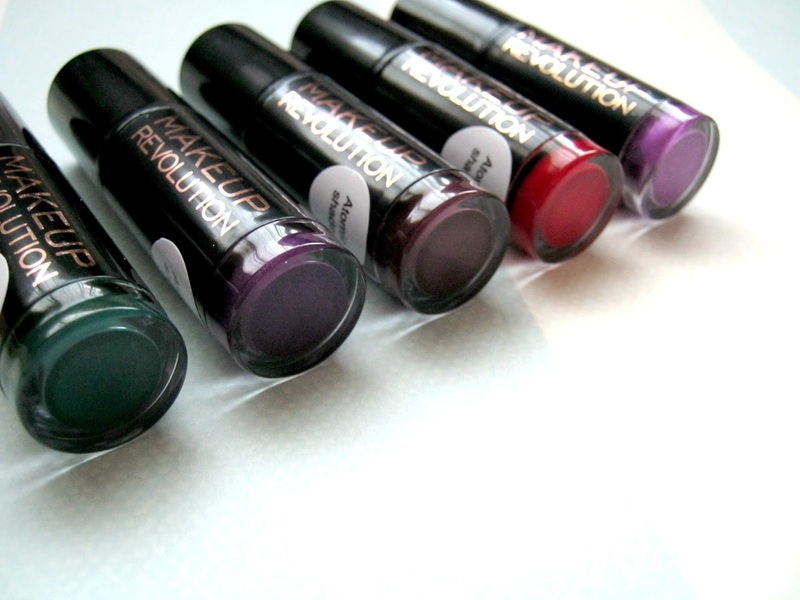 Look out for lots more Makeup Revolution reviews coming up, I've got so many new products to talk about from them! These all look so pretty, can't believe they're only £1! Love the green, so pretty! They are so cool, I love the iridescent effect on them!